Depending on where you are going, traveling can present a problem to us Celiacs. 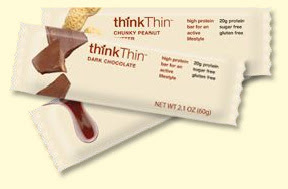 Luckily, the makers of ThinkThin bars have created delicious snack bars that are also gluten free! I first found out about these bars way back in the old days, when they still were designed to look like a body builder's delight. Now, they are have a tres chic design that goes well with everything. All of the ThinkThin bars are clearly marked as to whether they are gluten free -- my favorites are the Brownie Crunch and White Chocolate Chip. As a grad student I'm often packing a lunch -- I have a full day of classes every day and don't have time to get home to make my own lunch. 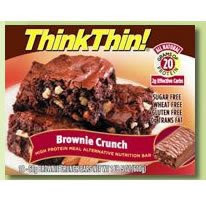 ThinkThin bars are a great protein-packed substitute when I don't have time to pack a lunch. I've also used the bars when traveling. I lived in Spain for close to 8 months and practically packed an entire suitcase full of these bars! They were wonderful to bring along with me, as I never knew what kind of food issues I was going to run into while traveling through Europe, particularly when I couldn't speak the language of a country I was visiting. I remember these bars being quite the lifesaver as my friends and I rode a 4 hour bus between Mararkesh and Essaouira in Morocco in the middle of the June heat. According to US Weekly, Madonna is reportedly a fan of ThinkThin bars -- and if the Queen enjoys them, how can they not be amazing? Check out the company's ThinkOrganic line for a nut-and-fruit based bar. The company also makes a special edition thinkThin Pink protein bar. The proceeds from the thinkThin Pink sales go to support research for women's cancer research and education. So if you are ever on the go, or need something to pack into your bag to take to work, ThinkProducts are a great gluten free go to snack. Order Directly from the website! On Sale At: Ralph's, Whole Foods, Trader Joe's. So funny - I posted a thinkThin review on my blog the same day you posted this. I reviewed the Brownie Crunch Bar - I loved it!